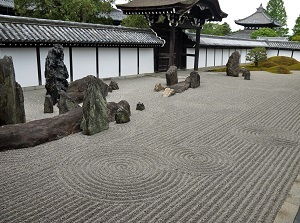 Tofukuji is a Buddhist temple of Rinzai Zen Buddhism, one of the three Japanese Zen sects, and is the central temple of a branch school of Rinzai sect. 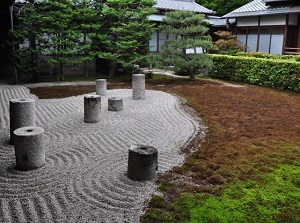 It is located about 2 km southeast of Kyoto station, and Sanjusangendo and Chichaku-in are located about 1.5 km north of this temple. 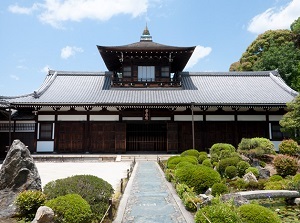 Originally here was Hosshouji temple built in 924. In 1236, Michiie Kugyo (1193-1252), who was the most powerful man attached to the court of the Emperor, decided to construct a great temple enshrining a 15-meter-high Buddha statue. 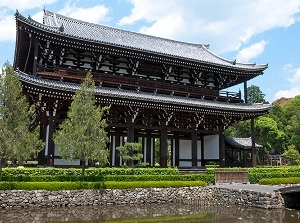 Then the temple was completed in 1255. So he gave this temple the name "Tofukuji". The huge Buddha statue was reduced to ashes by the fire in 1319, then it was recreated in the mid-14th century. But the temple was destroyed by fire in 1881, and the statue was burnt away again. At that time, only a hand of the statue was rescued. It is about 2 meters long and is housed in the temple. The current principal image is a set of three Buddha statues, and they were moved and enshrined from Manjuji temple, one of the branch temples in Tofukuji. 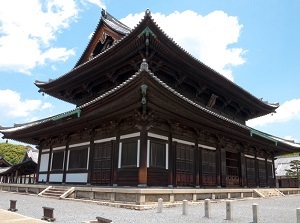 In the precincts, there are Sanmon gate, Hondou (Main temple), Houjou hall and many other buildings. And there are 25 small branch temples including Manjuji around the main temple, so the area is about 1 km from north to south and about 0.8 km from east to west in width. 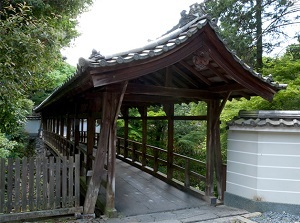 Sanmon gate was rebuilt in 1425, and is designated as a national treasure. It is the Japan's oldest gate of Zen temple, and is about 22 meters high. Main temple was completed in 1934 after the fire in 1881. It is 25.5 meters high and about 41 meters wide. 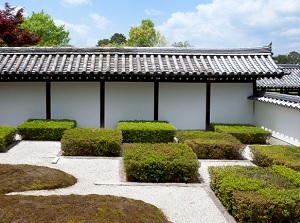 Houjou was rebuilt in 1890, and has four Japanese gardens with different characteristics. 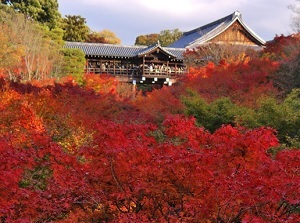 Tofukuji has many maple trees, so many people visit in the beautiful colored season in autumn. The following places are charged. 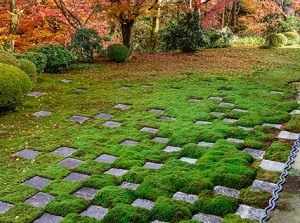 The admission fee to the gardens in Houjou is 400 yen. 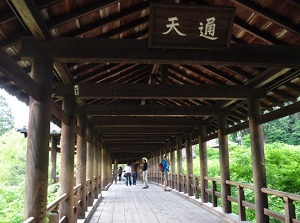 The admission fee to the Kaizando temple through Tsuutenkyo corridor bridge is 400 yen. By route bus with route No. 208, about 13 minutes from Kyoto station to Tofukuji stop. By route bus with route No. 202 or 207, about 11 minutes from Gion to Tofukuji stop.